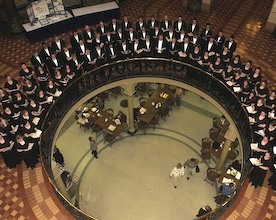 Comprised of about 70 students, Concert Choir is Cornell's large choral ensemble. Led by Dr. Lisa Hearne, the choir is open to all students and includes many non-majors. The goal is to provide an opportunity for all students interested in performing vocal music to work together toward a common artistic goal. A wide-ranging repertoire includes major works like Mozart's Requiem in D minor and Vivaldi's Gloria; classics from the baroque, classical, and romantic periods; American spirituals; contemporary works by American composers; and multi-cultural works. Concert Choir performs major concerts in December and April. Rehearsals are held Monday, Wednesday, and Thursday from 3:15 - 4:05, except during block break weeks, when they are Monday only. Sectional rehearsals are held on Tuesdays once or twice per block.